When you hear the term dental assisting and cosmetic dentistry, what’s the first idea that pops up in your mind? Perhaps you’re thinking about teeth whitening or other popular treatments undergone by celebrities to achieve perfect, shiny white teeth. To a certain extent, that is true. But on a larger scale, cosmetic dentistry goes beyond aesthetics, but what is cosmetic dentistry? Cosmetic dentistry refers to the procedures that dental assistants and dentists use to improve the smiles of their patients. While many of these are cosmetic in nature, quite a few of these are restorative and can solve numerous oral problems. Here’s a brief glimpse of a few cosmetic dentistry services. One of the most common cosmetic dentistry services that dental assistants help with is teeth whitening. To determine the right amount of whitening solution for patients, a dental assistant needs to create a custom mouthpiece. Teeth whitening may be performed at the dental office or at home under the supervision of the dental office. Whitening can be used to eliminate stains caused by food and drinks, medications, and cigarettes, or to make the teeth whiter by a shade. A dental assistant can use bonding, under the supervision of the dentist, to change the color of the teeth or even close gaps. But compared to other restorative treatments, bonding can sometimes be chipped or stained. For chipped or decayed teeth, composite resins may be used. Small cavities can also be filled by bonding. Crowns or caps are used to cover a tooth in order to restore its appearance and shape. Of all the types of cosmetic restorations, crowns last the longest. However, caps are also among the most expensive and most time-consuming service that a dental assistant will help with. Veneers may be used to change the color or shape of the teeth or for the treatment of misshapen, chipped, crooked, or unevenly shaped teeth.Veneers may be made out of either plastic or porcelain and are placed over the front teeth. These are usually recommended as an alternative to crowns. In the case of crooked, chipped or irregularly shaped teeth, the dental assistant may recommend tooth reshaping and contouring. The procedure performed in the dental office is used to change the position, length and shape of teeth and is sometimes used to correct minor bite problems. It may also be used in conjunction with tooth reshaping. When a patients are interested in a particular treatment, the dental assistant should inform them of what changes to expect, how the procedure is done, and what maintenance is required. In order to determine which procedures are right for the patient, the dental assistant should take into account the condition of the teeth as well as the patient’s goals. 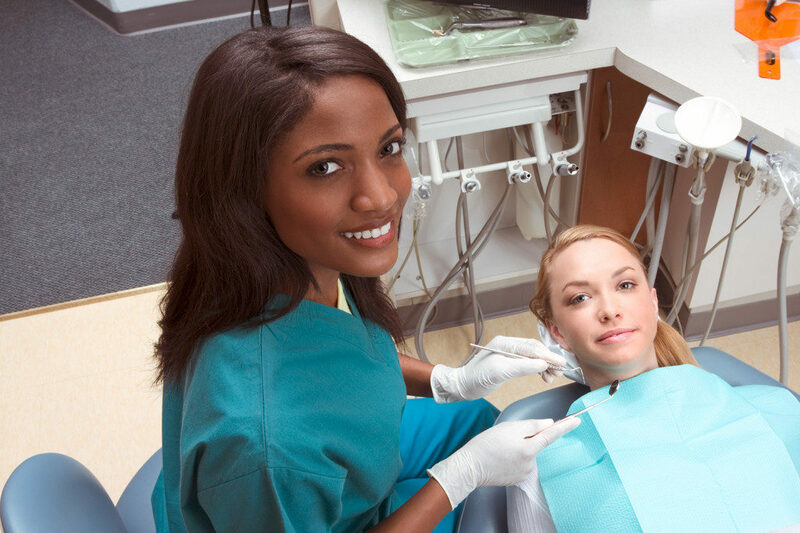 Are you ready to become a dental assistant? You owe it to yourself to get the training you deserve! Don’t wait… Email or call (760) 691-1933 today!